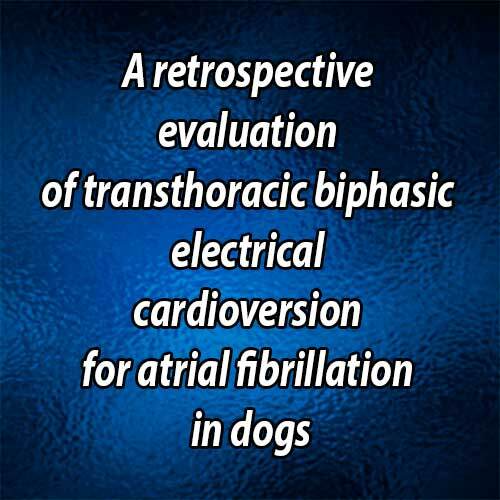 Bright J.M., Martin J.M., Mama K. A retrospective evaluation of transthoracic biphasic electrical cardioversion for atrial fibrillation in dogs // J Vet Cardiol. 2005 Nov;7(2):85-96. OBJECTIVES: To evaluate safety, efficacy, and clinical usefulness of biphasic transthoracic cardioversion for management of dogs with atrial fibrillation (AF). BACKGROUND: In dogs AF is usually managed with heart rate control rather than by restoration of sinus rhythm (SR). However, restoration of SR has potential advantages of improving cardiac output and reducing ventricular filling pressures, and biphasic cardioversion provides an improved benefit/risk ratio compared to traditional monophasic cardioversion. ANIMALS, MATERIALS AND METHODS: Retrospective analysis of data from 39 dogs with spontaneous AF managed with biphasic transthoracic cardioversion was done. Conversion characteristics, adverse effects, and duration of SR were evaluated. Effects of heart disease and pretreatment with amiodarone on success of cardioversion and on duration of SR were also evaluated. RESULTS: Restoration of SR was achieved in 36 of 39 dogs (92.3%). Presence of heart disease or atrial enlargement had no effect on cardioversion characteristics or ability to restore SR. Median duration of SR following cardioversion and treatment with amiodarone was 120 days. Dogs with lone AF remained in SR longer than those with heart disease. CONCLUSIONS: Biphasic cardioversion is safe and effective. Although duration of SR varied, a majority of dogs remained in SR long enough to benefit. Atrial fibrillation (AF) is the most common chronic pathologic arrhythmia in dogs.1 Although this arrhythmia typically occurs secondary to serious underlying cardiac disease, atrial fibrillation (AF) may occur spontaneously without an identifiable underlying cause in large and giant breed dogs (lone AF). In dogs with underlying heart disease, the onset of AF usually coincides with a deterioration in clinical status (such as onset of weakness, anorexia, syncope, or congestive heart failure), and AF is associated with a high mortality rate in these patients.2 The long-term effects of lone AF in dogs are not clear at this time. However, it is possible that in affected dogs, wide fluctuations of heart rate with peak and mean heart rates exceeding those that occur during sinus rhythm may produce and advance cardiomyopathy.3—6 The traditional management approach for dogs with AF has been to administer pharmacologic agents that slow the ventricular rate by slowing atrioventricular (AV) nodal conduction velocity. However, this approach may not provide adequate heart rate control in some patients.1,7 Furthermore, in patients with AF heart rate control fails to restore AV synchrony which is essential for optimal cardiac performance. The purpose of this study was to evaluate retrospectively the safety and efficacy of biphasic direct current (DC) transthoracic cardioversion for management of dogs with naturally occurring AF and to determine the duration of sinus rhythm after cardioversion. The hypothesis tested is that sinus rhythm can be successfully and safely restored in many dogs with atrial fibrillation (AF), even those with severe underlying heart disease. Data for this retrospective study were obtained from all canine patients having transthoracic biphasic DC cardioversion at the Veterinary Teaching Hospital (VTH) at Colorado State University between September 2000 and February 2004. All dogs underwent biphasic electrical cardioversion for management of spontaneous, sustained AF. Data were obtained from review of medical records and from review of cardioversion strips generated by the cardioverter/defibrillator device during the procedures. Specifically, these cardioversion strips displayed an electrocardiographic (ECG) rhythm strip prior to, during, and after delivery of each shock as well as the energy, current, and impedance of the shocks. If data for long-term outcome were not available from the medical record, referring veterinarians and owners were contacted by telephone. Information obtained from the medical records included signalment, initial complaint, history, weight, type of underlying structural heart disease (if any), medications (if any), and duration of sinus rhythm following cardioversion. Atrial size was evaluated from echocardiographic study performed prior to cardioversion. Left atrial enlargement was defined as a standard M-mode measurement of the left atrium exceeding the upper limit of normal based on body weight as previously established at our institution.10 Right atrial enlargement was defined as a right atrium larger than the left atrium evaluated on a standard left apical 4-chamber 2 dimensional echocardio- graphic image. Cardioversion strips were used to determine whether successful cardioversion was achieved. Successful electrical cardioversion was defined as restoration of sinus rhythm for at least 5 cardiac cycles following synchronous DC shock. In addition, the cardioversion strips were used to determine the number of shocks delivered to achieve successful cardioversion, the energy of delivered shocks, and the current needed for restoration of sinus rhythm. Cardioversions were done under general anesthesia in all dogs. Serum electrolyte concentrations were determined prior to anesthetic induction on the day of cardioversion. If the serum potassium concentration was less than 4.0 mEq/L, potassium chloride solution (2 mEq/ml) was administered intravenously by infusion syringe at a rate of 0.5 mEq/kg/h until the serum potassium concentration reached 4.5—5.5 mEq/L. If the total serum magnesium concentration was less than 2.0 mEq/L, magnesium chloride solution diluted to 100 mg/ml was administered as a slow intravenous bolus of 10—30mg/kg immediately prior to anesthetic induction. For all cardioversion procedures anesthesia was induced and maintained by the Anesthesia Service at the Veterinary Teaching Hospital. Anesthetic protocols were based on the condition of the patient and the preferences of the attending anesthesiologist. When premedication was deemed necessary based on the patient’s activity or anxiety level, an opioid (hydromorphone 0.1 + 0.02 mg/kg, oxymorphone 0.06 + 0.02 mg/ kg, or methadone 0.6 + 0.2 mg/kg) was administered subcutaneously approximately 30 min prior to instrumentation and patient preparation. Some patients also received a benzodiazepine (midazolam 0.2 + 0.05 mg/kg) or/and an anticholinergic (atropine 0.03 + 0.01 mg/kg or glycopyr- rolate 0.01 + 0.005 mg/kg) for premedication. Prior to anesthetic induction, the lateral thorax was clipped on each side from the axilla caudally and ventrally approximately 15 cm to facilitate placement and contact of the cardioversion paddles. Adhesive electrocardiographic electrodes were attached to the skin of the extremities and connected to the ECG leads of a Zoll rectilinear, biphasic cardioverter/defibrillator.c The synchronous mode (cardioversion mode) of the cardi- overter/defibrillator was selected to prevent current delivery during the ventricular repolarization phase of the cardiac cycle. Anesthesia was induced with fentanyl (0.013 + 0.004 mg/kg), etomidate (0.5 + 0.3 mg/ kg), or a combination of these 2 drugs combined with a benzodiazepine (diazepam 0.43 + 0.17 mg/kg or midazolam 0.24 + 0.12 mg/kg). Shortterm maintenance of anesthesia for cardioversion frequently necessitated additional doses of induction drugs and occasional supplementation with low doses of propofol. Heart rate and rhythm, Doppler blood pressure, oxygen saturation, and end-tidal carbon dioxide were monitored in all dogs during the procedure. While all patients were intubated and breathed 100% oxygen from a standard small animal breathing circuit, inhalation agents were generally not used during the cardioversion. A balanced anesthetic technique using an opioid and an inhalation agent (sevoflurane, isoflurane) was used for patients needing additional procedures after the cardioversion. In all dogs transthoracic cardioversion was done using a cardioverter/defibrillator device that delivers a rectilinear biphasic energy waveform.c Cardioversion paddles were applied by the operator directly to the clipped areas of the thorax with the top of the paddles at approximately the level of the point of the shoulders. c ZOLL M Series™, ZOLL Medical Corp., Burlington, MA, USA. Pediatric paddles (21 cm2) were used for dogs weighing less than 15 kg. Energy delivery was synchronized to the down slope of the QRS complex by the cardioverter/defibrillator by using the device in its cardioversion (synchronous) mode. Accurate recognition of QRS complexes by the device was confirmed by each operator prior to energy delivery. For most procedures the initial energy selected was low 35—50 joules (J), and additional shocks were delivered, if necessary, using upward titration of energy until successful cardioversion was achieved or until peak energy output of the device (200 J) was used. If a 200 J shock failed to restore sinus rhythm, quinidine gluconate was administered (0.5 mg/kg IV) in attempt to facilitate cardioversion, and the 200 J shock was then repeated (4 of 39 cardioversions). All patients received amiodarone (12—15 mg/kg PO q24h for 2 weeks followed by 5—7 mg/kg PO q24h indefinitely) in attempt to maintain sinus rhythm after cardioversion. In 14 of 39 cases amiodarone administration was initiated 2 weeks prior to the cardioversion procedure, but when immediate cardioversion was felt to be in the patient’s or owner’s best interest, amiodarone was initiated immediately after recovery from anesthesia. Longterm administration of amiodarone in the dogs was confirmed by documenting prescription refills in the medical records or by discussions with the referring veterinarians and owners. Pharmacologic cardioversion as a result of pretreatment with amiodarone was not observed in any dog. Several patients also received a Class 1 antiarrhythmic agent (quinidine gluconate 3 dogs, 0.25—0.5 mg/ kg IV, or procainamide 3 dogs, 8—10 mg/kg IM), or a Class 4 antiarrhythmic agent (diltiazem 2 dogs, 0.25 mg/kg IV) to suppress supraventricular ectopy in the immediate post-cardioversion period. Patients receiving medications for management of heart failure were continued on these medications at the same doses after cardioversion. However, drugs used solely for rate control prior to cardioversion (digoxin, diltiazem) were discontinued if sinus rhythm was restored. Table 1 shows the specific medications used for long-term treatment of heart disease in each dog. If sinus rhythm was restored, owners were asked to have their dog’s ECG reevaluated (by the referring veterinarian or at the VTH) in 7—10 days, then once monthly for 3 months, and then every 3 months. If recurrence of AF was noted, the date of the previous ECG showing sinus rhythm was used to define duration of sinus rhythm following cardioversion. Cardioversion procedures were repeated in an individual dog at the owner’s request when it was recognized that the patient’s rhythm had reverted to atrial fibrillation despite administration of amiodarone. Although some dogs had multiple cardioversions because of recurrence of AF, data from these additional cardioversions were evaluated independently from the initial procedure. For each response variable, a Shapiro—Wilk test was used to determine whether data were normally distributed.11 Normally distributed data are expressed as mean with standard deviation of the mean. Results are expressed as median with quartiles for data that were not normally distributed. The duration of sinus rhythm following cardioversion for those dogs successfully converted was evaluated using a log-rank test.12 For this analysis, data were censored when dogs died or were euthanized in sinus rhythm. The effect of presence or absence of structural heart disease on duration of sinus rhythm following cardioversion and the effect of presence or absence of atrial enlargement on duration of sinus rhythm following cardioversion were also evaluated using a log-rank test. t-Tests for 2 independent samples were used to evaluate the effect of structural heart disease, atrial enlargement, or pretreatment with amiodarone on the effective conversion energy and effective conversion current. The effect of pretreatment with amiodarone on the ability to restore sinus rhythm was assessed with a chi- square test. Statistical analyses were done using commercially available statistical software.d All comparisons were 2-sided. Results were considered significant when the observed P value was less than 0.05. Data from initial cardioversion were obtained from 39 dogs with spontaneous AF. The dogs were 1—14 years old with a mean age of 6.8 + 3.4 years. The mean weight of the dogs was 45.3 + 17.6 kg (range 6.8—77.3 kg). Eleven of the 39 dogs (28.2%) were Irish wolfhounds. Twenty-five dogs (64.1%) had underlying structural heart disease including dilated cardiomyopathy (30%), tricuspid valve dysplasia (4%), patent ductus arteriosus (4%), and mitral valve disease (26%). Fourteen dogs (35.9%) had lone AF. Twenty-five (64.1%) of the dogs showed clinical signs of heart disease prior to cardioversion. These clinical signs included weakness (19/25), inappetance (6/25), lethargy (1/25), anorexia (3/25), congestive heart failure (18/25), and syncope (7/25). Pretreatment for 2 weeks with amiodarone was a feature of 43.6% of dogs. 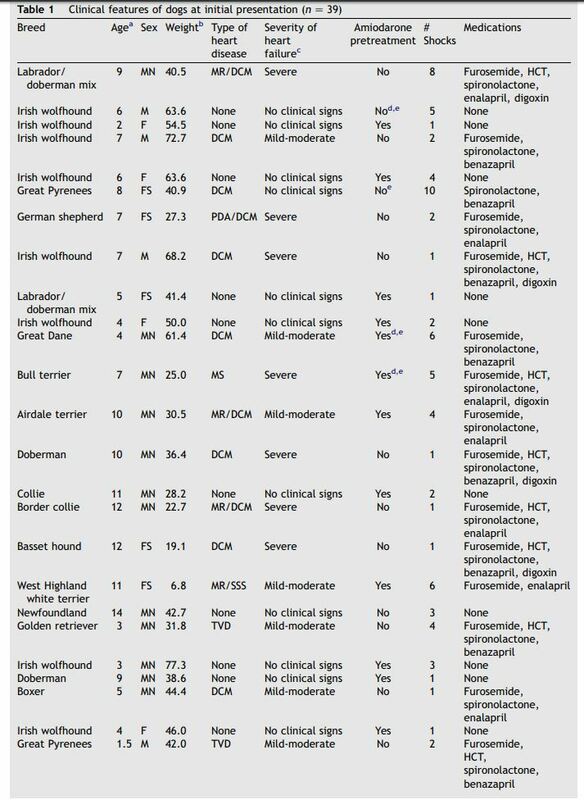 Table 1 provides signalment and clinical features at initial presentation of the dogs studied. 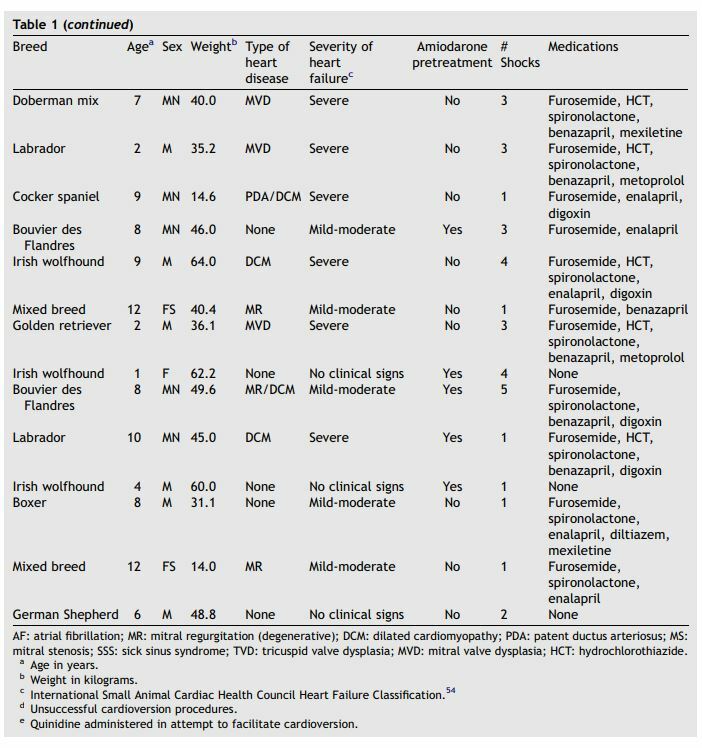 This table also identifies dogs pretreated with amiodarone. There were no clinically significant adverse effects of biphasic DC cardioversion. A brief period of asystole was noted immediately after shock delivery in one dog (Fig. 1), and a short run of ventricular tachycardia was noted in another (Fig. 2). However, in both animals these arrhythmias were brief and self-limiting. d SAS, version 8e, SAS Institute Inc., Cary, NC, USA. Successful restoration of sinus rhythm was achieved in 36 of 39 (92.3%) dogs. The mean current required for successful cardioversion was 10.9 + 3.8 amperes (A), and the median conversion energy delivered was 75 J (quartiles = 50 and 100 J). The median successful cardioversion energy expressed as a function of body weight was 1.8 J/kg (quartiles = 1.1 and 2.4J/kg). The number of shocks delivered during each cardioversion procedure ranged from 1 to 10 with a median of 2 shocks. Of the 4 dogs treated with quinidine gluconate when cardioversion initially failed, cardioversion was successful in 1 dog (maximum of 200 J attempted before quinidine gluconate administration). Restoration of sinus rhythm was not achieved in 3 dogs, one of which had lone atrial fibrillation (AF). 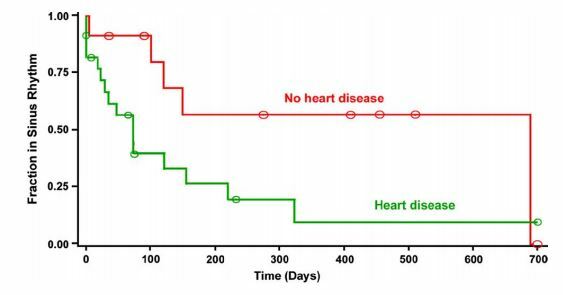 The presence of underlying structural heart disease had no significant effect on the current required to restore sinus rhythm (lone AF 10.3 + 2.1 A vs. structural heart disease 11.2	+ 4.3 A). Similarly, the presence of structural heart disease did not significantly affect either the total conversion energy (lone AF 75 J [quartiles = 50 and 100 J] vs. structural heart disease 100 J [quartiles = 50 and 120 J]) or the conversion energy expressed as a function of body weight (lone AF 1.3 J/kg [quartiles = 1.1 and 1.8 J/kg] vs. structural heart disease 1.9 J/kg [quartiles = 1.3 and 2.8 J/kg]). Cardioversion was successful in 12 of 14 dogs pretreated with amiodarone (85.7%) and in 24 of 25 of cardioversions done without pretreatment (96.0%). Although the frequency of successful cardioversion was higher in dogs without pretreatment, this difference was not significant (P = 0.25). Similarly, pretreatment with amiodarone did not significantly affect the current (P = 0.87) or the energy (P = 0.33) required to restore sinus rhythm. Eleven dogs had additional cardioversion procedures when AF reoccurred. One of these dogs had 3 cardioversions and another had 4 cardioversions; others had only a single additional procedure. Sinus rhythm was successfully restored with biphasic transthoracic cardioversion in 100% of the additional cardioversion procedures. The mean current required for successful cardioversion was 13.3	+ 5.9 A, and the median energy delivered was 100 J (quartiles = 50 and 120 J). The number of shocks delivered ranged from 1 to 10 with a median of 3 shocks. The median duration of sinus rhythm after the second cardioversion was 21 days (quarti- les = 1 and 90 days). The shock is delivered at the arrow, and there is asystole for 2.6 s before sinus rhythm begins. Data regarding duration of sinus rhythm following initial cardioversion were available for 34 of the 39 dogs. Sinus rhythm duration data were censored from analysis in 13 dogs that died in sinus rhythm, including a dog with the longest duration of sinus rhythm (censored at 700 days). Table 2 shows duration of sinus rhythm. The median duration of sinus rhythm for the entire group was 120 days (quartiles = 35 and 690 days). Dogs with lone AF remained in sinus rhythm longer after cardioversion than dogs with underlying heart disease (median 690 vs. 73 days; P = 0.037). Duration of sinus rhythm following cardioversion is shown graphically for these 2 subgroups in Fig. 3. There was a tendency for dogs without atrial enlargement to remain in sinus rhythm longer than dogs with atrial enlargement; however, this difference did not reach statistical significance (median duration 73 vs. 690 days; P = 0.093) (Fig. 4). There was not a significant effect of pretreatment with amiodarone on the duration of sinus rhythm following cardioversion (median duration 122 days with amiodarone pretreatment vs. 73 days without pretreatment; P = 0.88). The 2 primary goals of managing patients in atrial fibrillation (AF) are to relieve clinical signs and to prevent long-term complications. In any patient with sustained AF, the basic therapeutic question is whether these goals are best met by restoring sinus rhythm or by leaving the patient in AF and controlling the ventricular rate. The primary impetus for rhythm control in human patients is that restoration of sinus rhythm provides the most complete relief of symptoms and the greatest improvement in quality of life, particularly in patients with heart failure.13-16 Although a recent comparison of rate control to rhythm control in people with AF showed no survival benefit of restoration of sinus rhythm, uncontrolled symptoms due to atrial fibrillation (AF) and congestive heart failure were commonly noted in the rate control group.17 Traditionally, dogs with AF have been managed primarily with pharmacologic rate control. However, with this approach, lack of a synchronized atrioventricular contraction results in suboptimal cardiac performance.18-20 Because lack of a synchronized atrioventricular contraction adversely impacts hemodynamics,18-20 the rate control strategy may perhaps fail to provide adequate resolution of clinical signs in some dogs. Furthermore, some dogs are unable to tolerate the negative inotropic effects of many drugs used to control heart rate. Finally, heart rate can fluctuate widely in dogs with atrial fibrillation (AF) resulting in persistent activation of the sympathetic nervous system and predisposing to ventricular dysfunction.21-23 For these reasons restoration of sinus rhythm with biphasic DC cardioversion was attempted for the canine patients included in this evaluation. Figure 2 Cardioversion strip showing a run of ventricular tachycardia lasting approximately 3.8 s which has been initiated by the shock (arrow). The tachycardia spontaneously converts to sinus rhythm. a Structural heart disease vs. lone atrial fibrillation using log-rank chi-square test. b No atrial enlargement vs. atrial enlargement. c Pretreatment vs. no pretreatment. The results of this retrospective analysis clearly demonstrate that transthoracic cardioversion using a rectilinear biphasic energy waveform is a highly effective method of restoring sinus rhythm in canine patients. Successful cardioversion was achieved in a large percentage (92.3%) of the dogs despite presence of underlying structural heart disease in 64.1% of the dogs. Restoration of sinus rhythm was not affected by pretreatment with amiodarone. Figure 3 Graph displaying the distribution of duration of sinus rhythm after cardioversion for dogs with lone atrial fibrillation (n = 11) and for dogs with atrial fibrillation due to underlying heart disease (n = 23) (P = 0.037). The Y axis represents the fraction of patients remaining in sinus rhythm in each group, and the X axis shows time in days. Circles on the curves are times at which observations were censored. The Yaxis represents the fraction of patients remaining in sinus rhythm in each group, and the Xaxis shows time in days. Circles on the curves are times at which observations were censored. Biphasic DC cardioversion resulted in no clinically significant adverse effects in this group of dogs with atrial fibrillation (AF) suggesting that this management approach is safe as well as effective. Although measurements of plasma cardiac troponin I concentration were not done in most dogs in this study, previous studies in dogs24 and other spe- cies25—31 have shown biphasic energy waveforms to be safe and minimally damaging to the myocardium. Ventricular fibrillation has been described as a risk of traditional monophasic DC cardioversion in dogs.1 However, none of the dogs in this study, including dogs with severe congestive failure and systolic dysfunction, developed ventricular fibrillation from anesthesia or cardioversion. Quinidine prolongs the effective refractory period of the atrial myocytes, and intravenous quinidine is used to facilitate DC cardioversion in some human patients initially failing cardioversion.13,33 Administration of quinidine may have facilitated cardioversion in 1 of the 4 dogs in this series when restoration of sinus rhythm did not occur with maximal energy delivery alone. In people intravenous administration of the ibutilide, a Class 3 antiarrhythmic agent, is also used to facilitate electrical cardioversion.34 Although the ability to restore sinus rhythm in this study of dogs with naturally occurring chronic AF was nearly universal, duration of sinus rhythm following restoration of sinus rhythm was much more variable. The duration of AF prior to cardioversion has been thought to affect duration of sinus rhythm following cardioversion in people.21,35-37 AF is known to produce electrophysiologic and structural remodeling that promotes both maintenance and recurrence of this arrhythmia ("atrial fibrillation begets atrial fibrillation").36-42 However, duration of atrial fibrillation (AF) prior to cardioversion is often difficult to determine precisely in dogs, particularly in dogs without underlying heart disease that commonly show no clinical signs. Some dogs in this study were in sinus rhythm only for a brief time before recurrence of AF. Short duration of sinus rhythm following successful cardioversion is problematic in some human patients also. In fact, in human medicine this problem has acquired its own acronym, ERAF (early recurrence of AF).39,43 Although the definition of ERAF varies, generally this term is used for people in whom sinus rhythm lasts a week or less.37,39,43 Using this definition, early recurrence occurred infrequently in the dogs in this study. Unfortunately, our results do not provide a precise method of predicting which dogs with AF will have early recurrence of their arrhythmia. Nonetheless, the results indicate that atrial fibrillation (AF) reoccurs sooner in dogs with structural heart disease. Similarly, there was a tendency for dogs with atrial enlargement to have a recurrence of AF sooner than dogs with atria of normal size, and it is very likely that the effect of atrial enlargement on duration of sinus rhythm would have been statistically significant with data from a larger number of dogs. It is possible that recurrence of AF was detected sooner in dogs with heart failure than in dogs with lone AF because of the onset of clinical signs associated with recurrence. Nonetheless, even in dogs with heart disease and in dogs with atrial enlargement, the results are encouraging in that half of these dogs remained in sinus rhythm for more than 73 days. Although administration of amiodarone for 2 weeks prior to cardioversion did not have a statistically significant effect on maintenance of sinus rhythm after the procedure, the difference between pretreated and non-pretreated dogs (median of 122 days in sinus rhythm when pretreated compared to 73 days without pretreatment) is provocative and demands further study to determine if amiodarone has a meaningful benefit in a large population of dogs. Administration of amiodarone to all of the dogs following cardioversion may have had an effect on the long-term outcome. Amiodarone has been shown to be uniquely effective for maintenance of sinus rhythm after cardioversion in human patients,44-46 possibly because of the ability of this drug to prevent the electrophysiologic and biochemical consequences of remodeling.46 Since all dogs in this series received this antiarrhythmic agent, the data in this study cannot be used to address the effect of this drug on maintenance of sinus rhythm following DC cardioversion in dogs. It is possible also that other antiarrhythmic medications received by some dogs prior to cardioversion for treatment of underlying heart disease or received short-term after cardioversion to suppress supraventricular ectopy may have had an effect on cardioversion threshold or duration of sinus rhythm. However, too few dogs received these other antiarrhythmic agents to determine specific effects if any. Restoration of sinus rhythm was also highly successful in dogs undergoing biphasic transthoracic cardioversion multiple times because of recurrence of AF. Duration of sinus rhythm following additional cardioversion procedures varied from minutes to a maximum of 210 days. Although the mean current and median energy required to restore sinus rhythm were slightly higher than for initial cardioversion, there were too few dogs for statistical comparisons. Data generated from this retrospective study of dogs with spontaneous sustained AF indicate that transthoracic biphasic cardioversion using a rectilinear waveform is a safe and highly effective means of restoring sinus rhythm. Although the duration of sinus rhythm after cardioversion varied widely, many dogs, including some with underlying heart disease and atrial enlargement, remained in sinus rhythm long enough to benefit from the procedure. Kittleson MD, Kienle RD. Diagnosis and treatment of arrhythmias. In: Kittleson MD, Kienle RD, editors. Small animal cardiovascular medicine. St. Louis: Mosby; 1998. p. 469-93. Bonagura JD, Ware WA. Atrial fibrillation in the dog: clinical findings in 81 cases. J Am Anim Hosp Assoc 1986;22:111-20. Dibner-Dunlap ME, Tahmes MD. A simplified technique for the production of heart failure in the dogs by rapid ventricular pacing. Am J Med Sci 1990;300:288-90. Shinbane JS, Wood MA, Jensen DN, et al. Tachycardia-induced cardiomyopathy; a review of animal models and clinical studies. J Am Coll Cardiol 1997;29:709-15. Gallagher JJ. Tachycardia and cardiomyopathy: the chicken-egg dilemma revisited. J Am Coll Cardiol 1985;6:1172-3. Grogan M, Smith HC, Gersh BJ, et al. Left ventricular dysfunction due to atrial fibrillation in patients initially believed to have idiopathic dilated cardiomyopathy. Am J Cardiol 1992;69:1570-3. Brignole M, Menozzi C. Control of rapid heart rate in patients with atrial fibrillation: drugs or ablation? PACE 1996;19:348-56. Mittal S, Ayati S, Stein KM, et al. Transthoracic cardioversion of atrial fibrillation: comparison of rectilinear biphasic versus damped sine wave monophasic shocks. Circulation 2000;101:1282-7. Greene HL, DiMarco JP, Kudenchuk PJ, et al. Comparison of monophasic and biphasic defibrillating pulse waveforms for transthoracic cardioversion. Am J Cardiol 1995;75:1135-9. Goncalves AC, Orton EC, Boon JA, et al. Linear, logarithmic, and polynomial models of M-mode echocardiographic measurements in dogs. Am J Vet Res 2002;63:994-9. Shapiro SS, Wilk MB. An analysis of variance test for normality (complete samples). Biometrika 1965;52:591-611. Woolson RF, Clarke WR. Estimation and comparison of survival curves. In: Woolson RF, Clarke WR, editors. Statistical methods for the analysis of biomedical data. New York: John Wiley & Sons; 2002. p. 509-40. Pritchett DLC. Management of atrial fibrillation. N Engl J Med 1992;326:1264-71. Hohnloser SH, Kuck K-H, Lilienthal J. Rhythm or rate control in atrial fibrillation - pharmacological intervention in atrial fibrillation (PIAF): a randomized trial. Lancet 2000;356: 178-94. Dernellis J, Stenfanadis C, Toutouzas P. From science to bedside: the clinical role of atrial function. Eur Heart J 2000;2(Suppl. K):K48-57. Carlsson J, Neuzner J, Rosenberg YD. Therapy of atrial fibrillation: rhythm control versus rate control. PACE 2000; 23:891-903. AFFIRM investigators. A comparison of rate control and rhythm control in patients with atrial fibrillation. N Engl J Med 2002;347:1825-40. Sisson D, Brown R, Riepe R. Hemodynamic effects of atrial fibrillation in dogs with experimentally induced mitral regurgitation. J Vet Intern Med 1995;9:200 [abstract]. Wichmann J, Ertl G, Rudolph G, et al. Effect of experimentally induced atrial fibrillation on coronary circulation in dogs. Basic Res Cardiol 1983;78:473-91. Naito M, David D, Michelson EL, et al. The hemodynamic consequences of cardiac arrhythmias: evaluation of the relative roles of abnormal atrioventricular sequencing, irregularity of ventricular rhythm and atrial fibrillation in a canine model. Am Heart J 1983;106:284-91. Falk RH. Atrial fibrillation. N Engl J Med 2001;344:1067-78. Wasmund SL, Li J-M, Page RL, et al. Effect of atrial fibrillation and an irregular ventricular response on sympathetic nerve activity in human subjects. Circulation 2003;107: 2011-5. Cha Y-M, Redfield MM, Shen W-L, et al. Atrial fibrillation and ventricular dysfunction; a vicious electromechanical cycle. Circulation 2004;109:2839-43. Chapman PD, Vetter JW, Souza JJ, et al. Comparative efficacy of monophasic and biphasic truncated exponential shocks for nonthoracotomy internal defibrillation in dogs. J Am Coll Cardiol 1988;12:739-45. Wyse DG, Kavanagh KM, Gillis AM, et al. Comparison of biphasic and monophasic shocks for defibrillation using a nonthoracotomy system. Am J Cardiol 1993;71:197-202. Gliner BE, Lyster TE, Dillion SM, et al. Transthoracic defibrillation of swine with monophasic and biphasic waveforms. Circulation 1995;92:1634-43. Tang W, Weil MH, Sun S, et al. The effects of biphasic and conventional monophasic defibrillation on postresuscitation myocardial function. J Am Coll Cardiol 1999;34:815-22. Bardy GH, Marchlinski FE, Sharma AD, et al. Transthoracic damped sine wave monophasic shocks for transthoracic ventricular defibrillation. Circulation 1996;71:197-202. Jones JL, Jones RE. Decreased defibrillator-induced dysfunction with biphasic rectangular waveforms. Am J Physiol 1984;247:H792-6. Tung L. Detrimental effects of electrical fields on cardiac muscle. Proc IEEE 1996;84:266-378. White RD, Hankins DG, Atkinson EJ. Patient outcomes following defibrillation with a low energy biphasic trunctated exponential waveform in out-of-hospital cardiac arrest. Resuscitation 2001;49:9-14. Neal S, Ngarmukos T, Lessard D, et al. Comparison of the efficacy and safety of two biphasic defibrillator waveforms for the conversion of atrial fibrillation to sinus rhythm. Am J Cardiol 2003;92:810-4. Lundstron T, Ryden L. Chronic atrial fibrillation: long-term results of direct current cardioversion. Acta Med Scand 1998;223:53-9. Oral H, Souza JJ, Michaud GF, et al. Facilitating transthoracic cardioversion of atrial fibrillation with ibutilide pretreatment. New Engl J Med 1999;340:1849-54. Allessie MA, Boyden PA, Camm AJ, et al. Pathophysiology and prevention of atrial fibrillation. Circulation 2001;103: 769-77. Hobbs WJC, Fynn S, Todd DM, et al. Reversal of atrial electrical remodeling after cardioversion of persistent atrial fibrillation in humans. Circulation 2000;101:1145-51. Yu WC, Lee SH, Tai CT, et al. Reversal of atrial electrical remodeling following cardioversion of long-standing atrial fibrillation in man. Cardiovasc Res 1999;42:470-6. Timmermans C, Rodriguez LM, Smeets JL, et al. Immediate reinitiation of atrial fibrillation following internal atrial defibrillation. J Cardiovasc Electrophysiol 1998;9:122-8. Weigner MJ, Thomas LR, Patel U, et al. Early cardioversion of atrial fibrillation facilitated by transesophageal echocardiography: short-term safety and impact on maintenance of sinus rhythm at 1 year. Am J Med 2001;110:694-702. Allessie MA. Atrial electrophysiology remodeling: another vicious circle? J Cardiovasc Electrophysiol 1998;9:1378-93. Fynn SP, Todd DM, Hobbs WJC, et al. 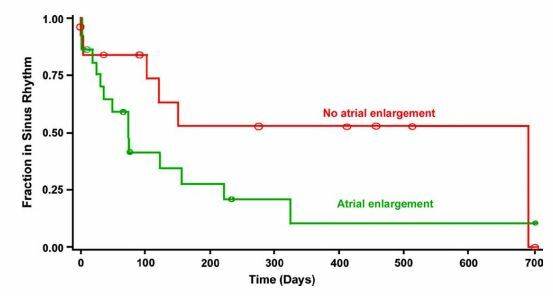 Role of dispersion of atrial refractoriness in the recurrence of clinical atrial fibrillation: a manifestation of atrial electrical remodeling in humans. Eur Heart J 2001;22:1822-34. Wijffels MCEF, Kirchhof CJHJ, Dorland R, et al. Atrial fibrillation begets atrial fibrillation: a study in awake, chronically instrumented goats. Circulation 1995;92: 1954-68. Peters NS. Post-cardioversion atrial fibrillation: the synthesis of modern concepts? Eur Heart J 2000;21:1119-21. Roy D, Talajic M, Dorian P, et al. Amiodarone to prevent recurrence of atrial fibrillation. N Engl J Med 2000;342:913-20. Kochiadakis GE, Igoumenidis NE, Marketou ME, et al. Low dose amiodarone and sotalol in the treatment of recurrent, symptomatic atrial fibrillation: a comparative, placebo controlled study. Heart 2000;84:251-7. Shinagawa K, Shiroshita-Takeshita A, Schram G, et al. Effects of antiarrhythmic drugs on fibrillation in the remodeled atrium: insights into the mechanism of the superior efficacy of amiodarone. Circulation 2003;107:1440-6. Mason JW. Amiodarone. N Engl J Med 1997;316:455-65. Bicer S, Nakayama T, Hamlin RL. Effects of chronic oral amiodarone on left ventricular function, ECGs, serum chemistries, and exercise tolerance in healthy dogs. J Vet Intern Med 2002;16:247-54. Van Opstal JM, Schoenmakers M, Verduyn SC, et al. Chronic amiodarone evokes no torsade de pointes arrhythmias despite QT lengthening in an animal model of acquired long- QT syndrome. Circulation 2001;104:2722-7. Bicer S, Nakayama H, Nakayama T, et al. Effects of chronic, oral amiodarone on left ventricular pressure, electrocardiograms, and action potentials from myocardium in vivo and from Purkinje fibers in vitro. Vet Ther 2001;2:325-34. Singh SN, Fletcher RD, Fisher SG, et al. Amiodarone in patients with congestive heart failure and asymptomatic ventricular arrhythmia. N Engl J Med 1995;333:77-82. Basilar JC, Louis TA, Lavori PW, et al. Studies without internal controls. In: Bailar JC, Mosteller F, editors. Medical uses of statistics. Waltham, MA: NEJM Books; 1986. p. 91-110. Moses LE. The series of consecutive cases as a device for assessing outcomes of interventions. In: Bailar JC, Mosteller F, editors. Medical uses of statistics. Waltham, MA: NEJM Books; 1986. p. 111-27. Fox PR, Sisson DD, MoYse NS. Appendix A. In: Fox PR, Sisson DD, MoYse NS, editors. Textbook of canine and feline cardiology. 2nd ed. Philadelphia: WB Saunders; 1999. p. 883.